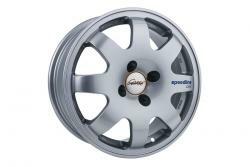 The Speedline Corse SL675 wheel is an 8 spoke classic design. Being both durable and lightweight the SL675 wheel is ideal for motorsport inspired road cars or is equally at home being used on the race track or for tarmac rally use. The SL675 wheels are available in Silver, Gold and Anthracite with a polished rim and all include brand detailing for an added quality touch, with wheels available in size 15''. 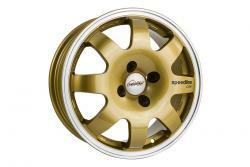 675 is a cost effective Aluminium Retro 15" version of the '2012 Acropoli Due' Magensium Rally wheel. Only available in Renault fitment.